Their heads and bodies of bats have amassed an extraordinary array of adaptations that have make them lords of the night sky. Today, the thousand-plus types of bats make up a fifth of living mammal species. Richard Dawkins once described the evolution of bats as “one of the most enthralling stories in all natural history” and as of this week, the story has a clearer beginning. The success of bats hinges on two key abilities: their mastery of flight, a feat matched only by birds and insects; and echolocation, the ability to navigate their way through pitch-blackness by timing the reflections of high-pitched squeaks. For evolutionary scientists, the big question has always been: which came first? Until now, fossil bats haven’t provided any clues for all of them show signs of both echolocation and flight. But a stunning new fossil, discovered by Nancy Simmons from the American Museum of Natural History is an exception and it provides a categorical answer to the long-running debate – the earliest bats could fly but could not echolocate. The new creature hails from the Green River in Wyoming and is known as Onychonycteris, meaning “clawed bat”. Its fossils date back to about 52.5 million years ago and by comparing it to other prehistoric bats, Simmons found that it is the most ancient member of this lineage so far discovered. It acts as a ‘missing link’ in bat evolution, much like the famous Archaeopteryx hinted that birds may have evolved from dinosaurs. Travel back in time to about 50 million years ago and you might catch a glimpse of a small, unassuming animal walking on slender legs tipped with hooves, by the rivers of southern Asia. It feeds on land but when it picks up signs of danger, it readily takes to the water and wades to safety. The animal is called Indohyus (literally “India’s pig”) and though it may not look like it, it is the earliest known relative of today’s whales and dolphins. Known mostly through a few fossil teeth, a more complete skeleton was described for the first time last week by Hans Thewissen and colleagues from the Northeastern Ohio Universities. It shows what the missing link between whales and their deer-like ancestors might have looked like and how it probably behaved.Whales look so unlike other mammals that it’s hard to imagine the type of creature that they evolved from. Once they took to the water, their evolutionary journey is fairly clear. A series of incredible fossils have documented their transformation into the masterful swimmers of today’s oceans from early four-legged forms like Pakicetus and Ambulocetus (also discovered by Thewissen). But what did their ancestors look like when they still lived on land? We humans aren’t used to having our intelligence challenged. Among the animal kingdom, we hold no records for speed, strength or size but our vaunted mental abilities are unparalleled. That is, until now. New research from Kyoto University shows that some chimps have a photographic memory that puts humans to shame. Sana Inoue and Tetsuro Matsuzawa have found that young chimps have an ability to memorise details of complex images that is literally super-human. Boffin chimp Ayumu, outperformed university students in memory tasks where they had to rapidly memorise numbers scattered on a touchscreen and press them in numerical order. This is the first time that an animal has outmatched humans in a mental skill. Recently, I’ve previously blogged about animals that show abilities once considered to be uniquely human, including jays that can plan for the future, rats that know how much they know, cultured chimps, tool-combining crows, and discriminating elephants. But in all these cases, the animals merely showed that they could do similar types of mental feats to us. They never challenging our abilities in terms of complexity or scale. Simply put, a crow may be able to combine tools together, but it’s never going to be able to engineer a computer. One of our extinct evolutionary cousins, Paranthropus robustus, may have walked like a man but it socialised like a gorilla. Using only fossils, UCL scientists have found that P.robustus males were much larger than females, competed fiercely for mates and led risky lives under heavy threat from predators. I wrote an article about the cool new finding for Nature Network. Here’s the opening and you can read the full article here. A single fossil can tell you about the shape, diet and movements of an extinct animal but with enough specimens, you can reconstruct their social lives too. 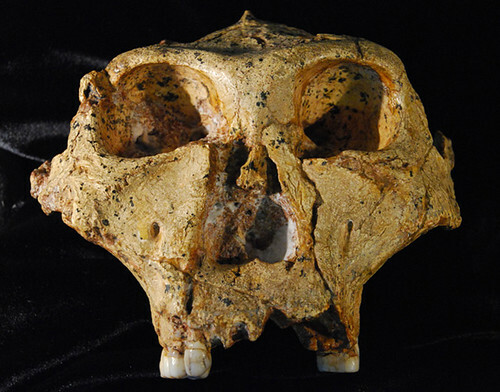 Charles Lockwood of University College London used an unusually large collection of fossils to peer back in time at the social structures of one of our closest extinct relatives, Paranthropus robustus, which inhabited southern Africa between 1.2 million and 2 million years ago. In my last post, I wrote about two studies which showed that even bacteria cooperate towards a common goal and can be infiltrated by cheating slackers. In one of the studies, cheaters were eventually weeded out through natural selection because their rise to prominence created such havoc for the group that each individual bacterium suffered. In this scenario, slacking wasn’t punished but merely reduced over time. But more complex creatures, like humans, have the capacity to actually recognise unfairness and punish it directly. It turns out that we’re very keen on doing that; so strong is our innate sense of justice that we’ll often punish cheaters at our own expense. Two years ago, Sarah Brosnan and Frans de Waal at the Yerkes National Primate Research Center found that brown capuchin monkeys also react badly to receiving raw deals. Forget bananas – capuchins love the taste of grapes and far prefer them over cucumber. 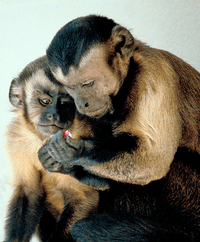 If monkeys were rewarded for completing a task with cucumber while their peers were given succulent grapes, they were more likely to shun both task and reward. That suggested that the ability to compare own efforts and rewards with those of our peers evolved much earlier in our history than we previously thought. Of course, animal behaviour researchers always need to be careful that they’re not reading too much into the actions of the animals they study. It’s tempting to think that elephants have their own PR agency. Just last week, their mighty reputation was damaged by the revelation that they are scared away by bees but they have bounced back with a new study that cements their standing among the most intelligent of animals. Lucy Bates and colleagues from the University of St Andrews have found that African elephants (Loxodonta africana) can tell the difference between different human ethnic groups by smell alone. They also react appropriately to the level of threat they pose. The Massai, for example, are a group of cattle-herders, whose young men sometimes prove themselves by spearing elephants. Clearly, it would pay to be able to sort out these humans from those who post little threat, like the Kamba. It’s a myth that elephants are afraid of mice, but new research shows that they’re not too keen on bees. Even though they fearlessly stand up to lions, the mere buzzing of bees is enough to send a herd of elephants running off. Armed with this knowledge, African farmers may soon be able to use strategically placed hives or recordings to minimise conflicts with elephants. Iain Douglas-Hamilton and Fritz Vollrath from Kenyan conservation charity Save the Elephants first suspected this elephantine phobia in 2002, when they noticed that elephants were less likely to damage acacia trees that contained beehives. Animals as powerful as the African elephant can go largely untroubled by predators. Their bulk alone protects them from all but the most ambitious of lion prides. But these defences do nothing against the African bees, which can sting them in their eyes, behind their ears and inside their trunks. Against these aggressive insects, the elephants are well justified in their caution and local people have reported swarms of bees chasing elephants for long distances.